Perhaps you are suffering from thinning hair or anticipating major hair loss from chemo. Selecting the right hairpiece can be daunting for first-time buyers. A common question arises – wigs or hair toppers? It helps to know the differences and pros and cons of each to ensure you choose the right solution for your hair loss needs. Wigs are the only option to achieve complete coverage of hair loss or balding associated with alopecia, chemo, or other causes. Wigs make the morning routine easier and after an initial investment, will save you a lot of money on hairstyling, cuts, and coloring. You have to comb them and wash wigs on occasion, but far less than your own hair. Moreover, you’ll no longer have to worry about static, split ends, out-of-place hairs, or the negative effects of humidity on your hair. Wigs are generally more expensive, require some care, and take a little longer to get accustomed to wearing. Some women don’t like to exercise when wearing a wig because it adds weight and warmth. They aren’t as practical as scarves at beaches, pools, or any outdoor venue on hot summer days. If you wear a wig and still have a full head of hair underneath, keep in mind it will be messy and sweaty after wearing a wig and will require some attention! Hair toppers offer partial coverage, so they are a perfect solution for people with gradual hair loss, thinning hair, or problem spots. They tend to look quite natural, so most people will not guess you’re wearing one. They can be worn with natural hair tied in a ponytail. Toppers are typically lightweight, so you don’t have to worry about your scalp getting too warm. Of course, toppers are made of less hair, so in most cases, they are more economical than full head wigs. Toppers are not an option for complete hair loss associated with alopecia, chemo, or other medical conditions. For a topper to look natural, it needs to exactly match the color and texture of your own hair. Many women with thinning spots or sensitive scalps cannot wear clips because they are too uncomfortable. Moreover, using less expensive clips can damage remaining hair. Bonding with glue or tape is a possibility, however this requires more work. When you wear a topper, you still have to style your own hair, which can take time. Wigs come in many different shapes and styles, each of which has benefits and drawbacks. Human hair or heat-friendly synthetic wigs offer great versatility because they can be styled with heated tools such as curling irons, straighteners, or hot rollers to achieve different looks. Monofilament cap wigs enable the part of the hair to be altered, while lace front wigs create a natural-looking hairline, allowing hair to be pulled back from the face for a different look. Here is a quick summary of key wig features. Available in synthetic and human hair. Attachment to existing hair is not needed. Available in a variety of styles and colors to match your preferences. Many types of wigs can be versatile to achieve multiple looks in a single wig. Hair toppers or wiglets are designed to conceal hair loss at various stages and different areas of the scalp. Some toppers offer more coverage on the top, while others cover the sides or back of the head. A topper is also ideal for adding volume to thin or fine hair. 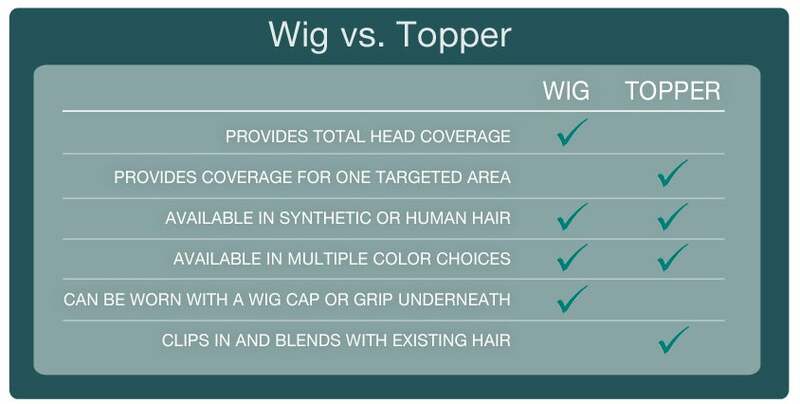 When selecting a topper or wiglet, key things to look at include the base style and size, hair length, hair type and color. This will help determine which topper style is right for you. Here is a quick look at a few hair topper features. Provides coverage and adds volume for thinning spots. Adds overall volume to existing hair. Attaches with clips to existing hair. Available in a variety of styles and colors to integrate with your own hair. Available in human hair or synthetic hair. © 2014-2017, Headcovers Unlimited, Inc. All Rights Reserved.